Donald Trump has said his relationship with Theresa May is "very, very strong", just hours after his comments attacking her Brexit plan emerged. Speaking at the PM's Chequers retreat, Mr Trump said his first official UK visit was "really something". He did not respond to questions about an interview with the Sun, in which he said Mrs May's plan would "probably kill" any US-UK trade deal. Meanwhile, protesters have floated a blimp of Mr Trump as a baby in London. 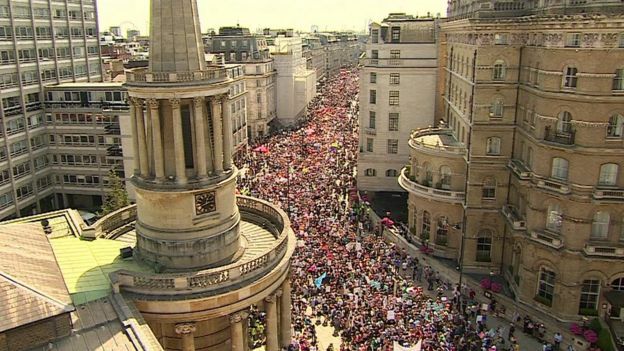 It is part of a demonstration against the US president in Parliament Square, one of a number taking place across the UK on Friday. Mrs May has not commented on the Sun interview but ahead of Friday's talks she said the pair would be discussing the "special relationship", along with foreign policy, a possible trade deal and defence and security issues. Speaking at Chequers, Mr Trump said they had discussed "some incredible anti-terrorism things". He also said he and Mrs May had spoken for an hour and a half at the black-tie dinner, which he attended with his wife Melania at Blenheim Palace on Thursday evening. Mr Trump arrived at Chequers by helicopter after visiting the Royal Military Academy Sandhurst on Friday morning. He and Mrs May will hold a joint press conference following their talks. Meanwhile, First Lady Melania Trump played bowls with the PM's husband, Philip May, at the Royal Hospital Chelsea in London. She met Chelsea pensioners and local children. During Thursday's dinner, news broke that the Sun had published the interview with the president. Mr Trump - who has been a long-time supporter of Brexit - said Mrs May had not listened to his advice on how to do a Brexit deal, saying: "I would have done it much differently." 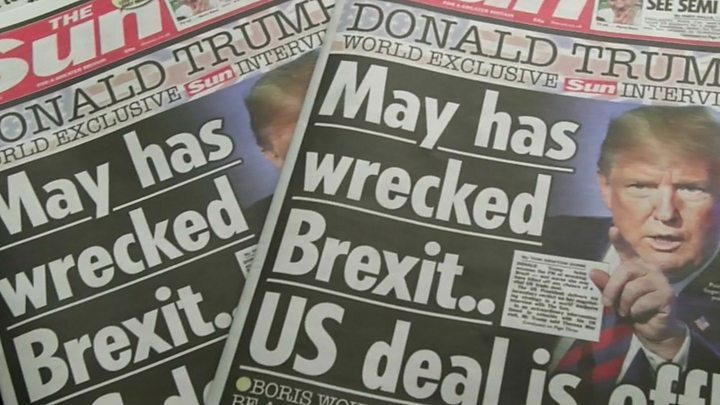 Tom Newton Dunn,The Sun's political editor: "It's probably the last thing (Theresa May) needed"
Mr Trump also said that former Foreign Secretary Boris Johnson - who disagrees with the PM on Brexit and resigned this week - would make a "great prime minister", adding: "I think he's got what it takes." And he renewed his criticism of London Mayor Sadiq Khan over last year's terror attacks in London, saying he had done "a terrible job". After it was published, White House spokeswoman Sarah Sanders said the president "likes and respects Prime Minister May very much", adding that he had "never said anything bad about her". Tom Newton Dunn, the Sun journalist who interviewed Mr Trump, said the US president seemed "sensitive" and knew about the "Trump baby" inflatable. "He's really quite stung by the criticism he's been getting," said Mr Newton Dunn. "He knew all about the baby blimp. I think it hurt him." Extra security is in place to police protests planned for the second day of Mr Trump's visit. 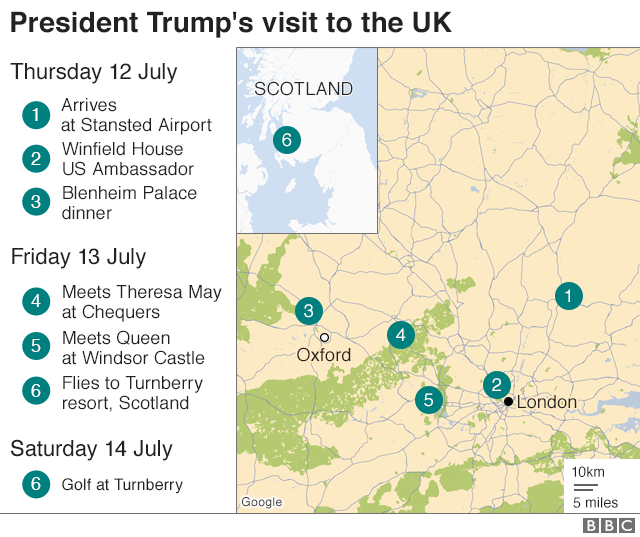 The president and first lady will travel to Windsor on Friday afternoon to meet the Queen, before flying to Scotland to spend the weekend at Mr Trump's Turnberry golf resort. This part of the visit is being considered private. Mayor of London Sadiq Khan defended his decision to allow the giant Trump baby inflatable to fly and on the president's criticism of his response to terrorism said it was "interesting" that the mayors of other cities which have experienced attacks were not mentioned. 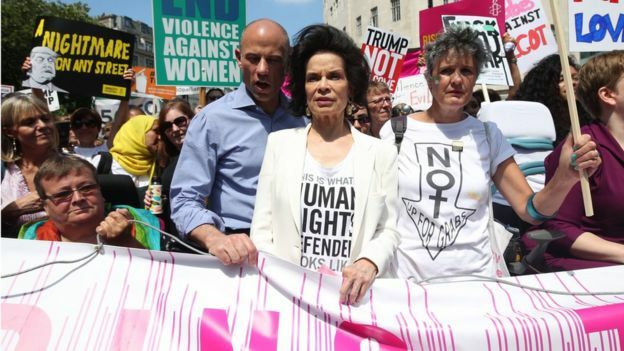 Meanwhile, shadow foreign secretary Emily Thornberry said the PM "should be standing up to [Mr Trump]" after he "slagged her off", instead of holding his hand.